When I tell people I'm "self publishing" my books, most of them don't understand what I'm talking about and some simply sneer. There's a lot of confusion between self-publishing and "vanity" publishing. 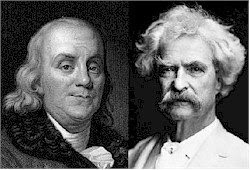 Mark Twain and Ben Franklin were self-publishers, and they didn't deserve sneers. I hope I don't, either. Vanity publishing companies exist to feed the egos and extract money from writers who have no chance of being a financial success, but are willing to pay money to have books printed with their names on the covers. Often their egos are much larger than their talents. They'll pay money even if it means that none of the books will ever be sold in stores and most of them will pile up in the garage rotting away with mildew until they are finally dumped when the author dies or the house is sold. Self publishing, on the other hand, is usually done by authors who have some hope of financial success, and want more control of the final product, speed-to-market, and more profit than they would have if they worked through traditional publishers.